Alex Zois, who placed first in the individual all around and earned top-three finishes in all events, competes on the balance beam at the Pink Meet on Friday night. 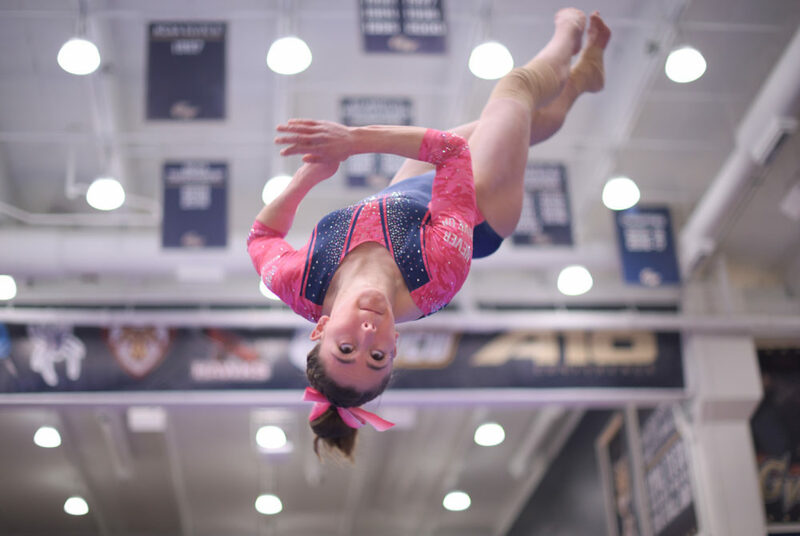 Gymnastics continued its stretch of strong performances at the Smith Center with a first-place finish at GW’s annual Pink Meet. The Colonials (3-5, 1-3 EAGL) competed with New Hampshire, William and Mary and Yale Friday night. The Colonials hold a 42-2 home record since 2015 and posted an all-around total of 195.400 – a season-high – in the team win that extended its winning record. Fifth-year captain Alex Zois was the all-around champion with an individual total of 39.300. Alex Zois on the winners podium after placing first in the individual all around. New Hampshire took second on the night with a final score of 194.925 followed by Yale in third place with a team score of 194.050. William and Mary rounded out the competition with a score of 189.925. GW cracked the 195-point mark for the first time this season, which head coach Margie Foster-Cunningham said was “critical” to her team’s success. Trailing New Hampshire 194.925-146.325 heading into their final routine, the floor exercise, the Colonials scored a season-best 49.075 team total to squeeze out the win. 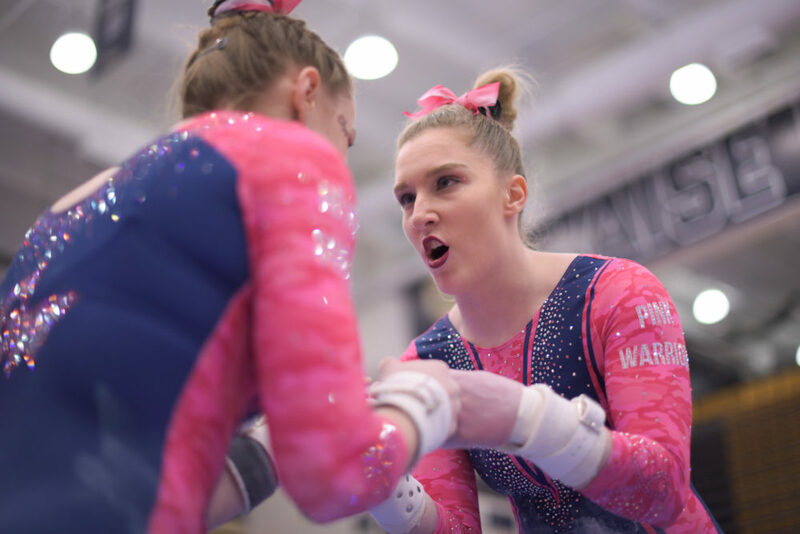 Zois earned a meet-high 9.900 on the floor, and junior Cydney Crassa notched a 9.825 to propel GW to a slim victory over New Hampshire and avenge a 195.500–194.475 loss to the Wildcats in New Hampshire last week. The Colonials were on the vault for their first rotation of the night. 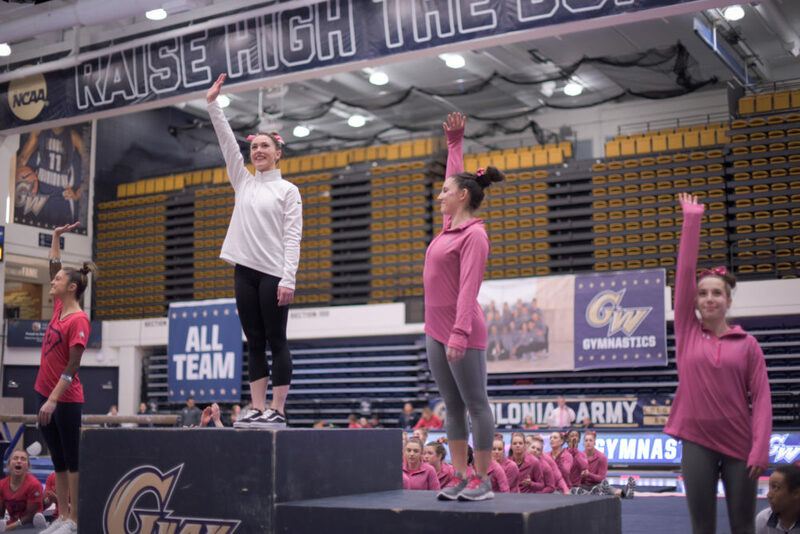 Coming off a season-high of 48.700 on the vault Sunday, GW tallied a team total of 48.675 in the event. The squad was led by senior captain Julia McLaughlin, who matched her career-high with a score of 9.800. Zois scored a 9.775 on the vault and Crasa led off the event with a 9.750. After the first rotation, the Wildcats were in the lead with a team score of 48.900 and the Colonials were close behind in second place. The Colonials impressed on the bars with a team score of 48.975 in their second event of the evening. Zois recorded a 9.825, and McLaughlin, fresh off a career-high performance on the bars last week, nabbed a 9.800. Four of the six gymnasts who competed on the vault earned a 9.800 or better and all six gymnasts put up scores higher than 9.725. The bars launched GW into first place to lead the pack with a 97.650 team score after two events, just ahead of the Wildcats, who posted a 97.475 on uneven bars and beam. On the floor exercise, New Hampshire recorded a stellar 49.000 team score while the Colonials concurrently scored a 48.675 on the beam, led by a 9.850 score by sophomore Hannah Cohen. GW’s team total on the beam was second only to Yale on the night in that category. The Colonials trailed New Hampshire 146.475–146.325 heading into the floor exercise, their fourth and final routine of the night. As the Colonials took to the floor exercise, New Hampshire earned a 48.450 on vault, their final event of the night, to end with an all-around score of 194.925. The meet was shaping up to be a close finish between the Colonials and Wildcats, but stellar performances by Crassa and freshman Simone Banen to end the floor exercises permitted the Colonials to throw out freshman Olivia Zona’s 9.500 score and ensure a victory. Simone Banen talks to a teammate before her routine on the uneven bars. The Colonials will travel to Oklahoma City to face No. 1 ranked Oklahoma at the Perfect 10 Challenge Friday at 7:45 p.m.